This magazine began by covering fantasy and science-fiction role play and board games such as Dungeons & Dragons, RuneQuest and Traveller, but now the magazine is dedicated to miniature war games such as Warhammer Fantasy Battle and Warhammer 40,000. You will also find the Lord of the Rings Strategy Battle Game in Warhammmer Visions. It is is dedicated to mini-game scenarios and you can completemost games in a single night’s gaming. These games are in the form of interesting and somewhat complicated tasks for characters to resolve. Games can be in the form of existing campaign plots or stand alone. Geared to a fun evening’s entertainment. Warhammmer Visions is divided among Warhammer Fantasy Battle, Warhammer 40,000 and the Lord of the Rings SBG. Each game has equal pages that are paced for thinking. 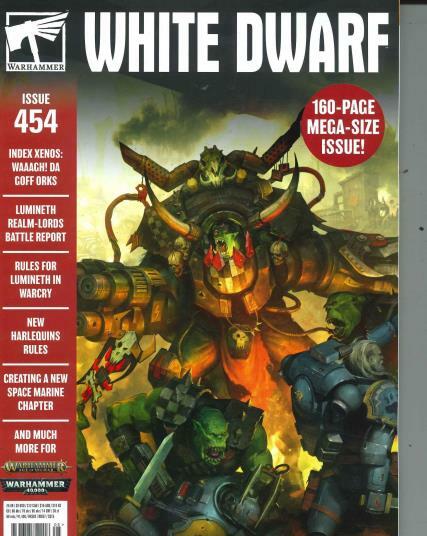 The monthly battle reports are White Dwarf’s Magazine popular features and are accounts of battles between different fantasy fiction armies. Featured are the army selections, tactics and deployment that are designed to lead you up to a fantastic conclusion. Enormous amount of detail. A really good read which keeps my teenage grandson riveted from one edition to the next. It goes to school to be read on the bus daily!